Oddly enough, it’s the knack of endlessly producing functional and reliable products that makes Toyotas of today (except for the utterly brilliant GT-86) rather dull and soulless appliances. 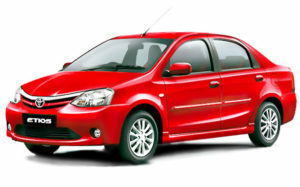 Take the Etios for instance. On sale in the Indian market since 2010, the car has come under heavy criticism for its uninspiring design and low-rent interior. So when we heard that Toyota was bringing out a facelifted version, our first thoughts leapt to visions of a refreshing new Etios that is far more impressive to look at and sit in, compared to the earlier model. The automaker has designed it with an overall length of 4265mm along with a width of 1695mm (including external mirrors). It has a total height of 1510mm, whereas its wheelbase comes to 2550mm. It has a minimum ground clearance of 174mm, which is quite decent. This sedan has an eye catching body design and includes a lot of interesting aspects. The front fascia has a redesigned radiator grille with a single chrome slat and is engraved with a prominent insignia in its center. There is a body colored bumper, which includes an air dam that cools the engine swiftly. There are a couple of intermittent wipers fitted to its wide windscreen, while there are expressive lines on the bonnet. It has a bright headlight cluster that is equipped with halogen headlamps and turn indicators as well. The rear end features a body colored bumper along with a pair of reflectors. It has a stylish boot lid that is garnished with chrome and embossed with company’s emblem. Whereas it has a wide windshield that is integrated with a high mount stop lamp. Besides these, it includes a radiant tail light cluster and a roof mounted antenna, which completes the look of its rear profile. The sides looks simply attractive with a set of 15 inch steel wheels that have full wheel caps and covered with tubeless radial tyres of size 185/60 R15. The body colored door handles as well as outside rear view mirrors further adds to its appearance. The low speed ride, as a result, is stiffer than before which means you do feel some of the undulations on the road. That said, the ride improves as speeds increase.The suspension also does a brilliant job of ironing out the bumps and ruts, however you do hear a loud thud when you crash into large potholes. The list of safety aspects include dual front SRS airbags, driver seat belt warning light with buzzer , engine immobilizer, keyless entry, headlamp-on warning as well as door ajar notifications that adds to the safety quotient. This mid range trim is loaded with a number of comfort features that gives an enjoyable driving experience to its passengers. It is bestowed with an efficient air conditioning system that comes along with a heater and clean air filter. There are all four power windows including driver’s side auto down function. It has a tilt adjustable steering wheel and LCD type fuel meter with a digital clock. The front seats have adjustable headrests, while the driver’s seat has height adjustment facility. The 12V power outlet is quite useful for charging phones and other devices. Its stylish instrument includes a digital tripmeter, tachometer, low fuel warning light panel and displays few other notifications, which makes it quite convenient for the driver. In addition to these, it includes day and night inside rear view mirror, air vents, remote fuel lid as well as tail gate opener, speakers, rear defogger and front cabin lights that enhances the comfort levels. There is no doubt that the new Toyotra Liva hatchback definitely has received some worthy upgrades especially if we talk about the safety side. The changes to the exterior have certainly given it a more sporty appeal which definitely will attract much attention, while the refreshed interior too adds a premium touch to the hatchback as well. Although there are no mechanical changes but all those above mentioned changes has made this hatchback worth every penny.